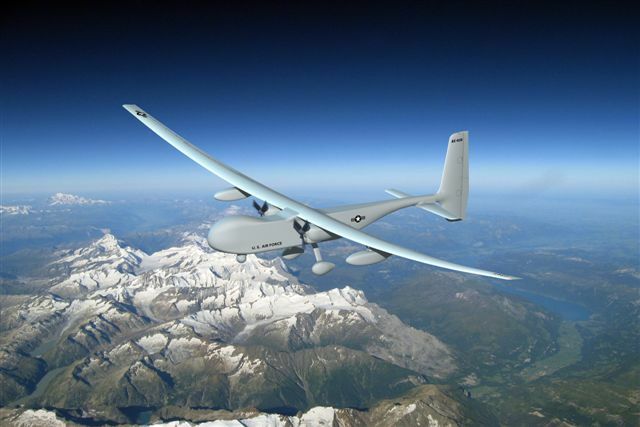 Aurora Flight Sciences is in talks with potential system integrators to help put its Orion five-day-endurance unmanned aircraft into production if a U.S. Air Force-funded technology demonstration proves successful. The small Manassas, Va.-based company rolled out the first of three planned Orion demonstrators at its Columbus, Miss., plant on Nov. 22, barely three months after being selected by the Air Force Research Laboratory for the first phase of the Medium-Altitude Global ISR (intelligence, surveillance and reconnaissance) and Communications (Magic) program. For Aurora, which has yet to see any of its previous UAV designs reach production, winning the nearly $100-million joint capability technology demonstration (JCTD) is significant because both the MQ-1 Predator and RQ-4 Global Hawk began life as similar projects and went on to become lucrative production programs. Sponsored by U.S. Central Command, the three-year Magic JCTD covers three aircraft, their payloads and an overseas deployment to assess the military utility of a UAV that can stay aloft for five days. Orion is designed to fly for 120 hr. at 20,000 ft., carrying a 1,000-lb. multi-sensor payload. This compares with 24 hr. for the MQ-1B Predator with a 450-lb. payload. The 120-hr. endurance targeted by the JCTD translates into a time-on-station capability ranging from 113 hr. at 550-nm. range to 47 hr. at 3,000 nm. That goal is to be achieved through a combination of efficient aerodynamics and propulsion, lightweight airframe, reliable systems and autonomous operation, as well as changes in how the UAV is flown that are enabled by its long range and endurance. Staying five days aloft reduces the number of takeoffs and landings required to maintain an orbit, reducing the accident risk and associated costs, says Langford. A mission range of more than 9,500 nm., compared with 675 nm. for the Predator, allows the Orion to be positioned farther from its patrol area, at a main operating base where fuel costs less than when transported to a forward operating location. “It all plays into the cost of time of station,” he says. Affordability is also a requirement, and Aurora is aiming for unit price significantly under the original $10-million target for the Global Hawk. Orion will be more expensive than a Predator, which the Air Force says costs $20 million for a four-aircraft system, but Langford believes it will be cheaper than the MQ-9 Reaper, which the Air Force says costs $53.5 million for a four-aircraft system. The RQ-4B version of the Global Hawk, by comparison, has a unit cost of $55-81 million, according to Air Force figures. Orion has an empty weight of just under 5,170 lb. and a maximum takeoff weight of just over 11,170 lb., allowing 5,000 lb. of fuel to be carried in addition to the 1,000-lb. payload. By comparison, an MQ-1 Predator weighs just 1,130 lb. empty and 2,250 lb. on takeoff with 665 lb. of fuel. Orion can carry up to 2,500 lb. of sensors and weapons, including external pods—with a payload capacity of up to 950 lb. in the nose, 850 lb. in the aft fuselage and 1,200 lb. under each wing. Initially the UAV will carry a pair of Raytheon MTS-B electro-optical/infrared turrets, but options include a Northrop Grumman Vader ground moving-target-indication radar under the nose and a multi-camera wide-area surveillance sensor in the aft bay. Orion is also capable of carrying fuel tanks or Hellfire missiles under the wing. Rollout out the first aircraft 88 days after contract award seems fast, but was a long time coming for Aurora, which began work on the Orion in 2006 under a U.S. Army program to build a hydrogen-fueled high-altitude long-loiter UAV. The design morphed into a conventionally fueled medium-altitude long-endurance platform for the Air Force, but the wing and tail were retained and reused. “It’s not a completely clean-sheet start,” says Langford. The Orion’s 132-ft. span is more than twice the Predator’s 55 ft. and slightly longer than the Global Hawk’s 131 ft., but the composite wing is a single piece tip-to-tip. This reduces structural weight and production cost, says Langford, but means the aircraft cannot be disassembled and airlifted to a forward base. “Today’s UAVs have to be taken apart and shipped in a box, but that is not how big aircraft move around,” he says. Trading transportability for low weight and long endurance is “a paradigm shift in the medium-altitude market,” says Langford, and is enabled by the Orion’s extreme range. At 13,000 nm., the UAV’s ferry range exceeds even the Global Hawk’s, but the aircraft is slow—barely reaching 90 kt. compared with 310 kt. for the RQ-4B and 200 kt for the MQ-9 Reaper. That is by design, he says, as flying slower improves fuel efficiency and allows use of a pair of diesel engines rather than more costly and thirsty gas turbines. The Orion is powered by a pair of FAA-certificated Austro Engines AE300 turbo-diesels. Rated at 170 hp. each, these are the same engines that power the Diamond DA42 Twinstar and are familiar to Aurora, which markets the Austrian-designed four-seat light aircraft as a surveillance platform in both manned and optionally piloted form. “Flying slower has the benefit of reducing power and increasing endurance, but we have to balance that with weather tolerance so it’s not the slowest thing out there,” Langford says. Orion is, in a sense, competing against other long-dwell ISR concepts such as the hybrid airship being built by Northrop Grumman under the U.S. Army’s Long-Endurance Multi-Intelligence Vehicle technology demonstration. Autonomous operation factors into lower on-station costs by reducing the training and people required to operate the system, and the Orion is designed to take off and land, Global Hawk-style, without a pilot in the loop. Onboard systems also have to be highly reliable to meet the 120-hr. on-station objective. “Some pieces are triplex-redundant, some are duplex. There is no single point of failure,” says Langford. The autonomous control system has evolved over several UAV projects and has at its core flight-control computers developed by Athena Technologies, which began life as a spinoff from Aurora and is now part of avionics manufacturer Rockwell Collins. “They do the inner-loop control and we do the mission management,” he says. Under the initial phase of Magic leading up to the Orion’s first flight, the control system will be flight-tested first in Aurora’s Centaur optionally piloted vehicle, which is based on the Diamond DA42. Beginning in late January or early February 2011, the software will be demonstrated and qualified on the Centaur—the aircraft flying in unmanned mode but with a safety pilot on board— before being ported over to the Orion. Aurora hopes to fly the Orion from its Golden Triangle airport facility near Columbus—its design making transport to a military air base for a first flight in restricted airspace problematic: “It’s like building an ark in your basement,” Langford jokes. This will require permission to fly the UAV in civil airspace. Stark Aerospace—an Israel Aerospace Industries subsidiary also based at Golden Triangle—is already working with the FAA on a certificate of authorization to fly the IAI Heron UAV, and Aurora hopes to piggy-back on that approval. After the first flight, the second phase of the Magic program will focus on demonstrating the 120-hr. objective. This is planned to be followed by a third phase involving payload flights and the overseas deployment. A subsidiary of The Boeing Company has joined efforts to design and develop an electric propulsion system for a light aircraft.